Jack spent many years working in radio as a performer, announcer, writer, producer and compere. 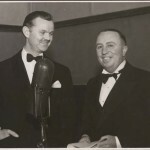 Jack had a perfect radio voice and, according to Bert Newton, was a master of ‘theatre of the mind’. 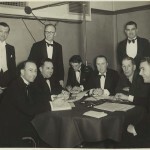 Credit: 3AW test cricket broadcast, 1938. Seated 4th from left is Jack O’Hagan. 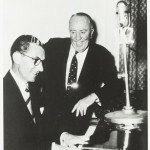 Credit: Well known pianist and organist Laurie Wilson and Jack O’Hagan at 3KZ studios, 1950s. Jack O'Hagan Collection, State Library of Victoria. 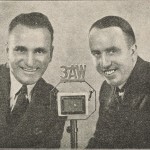 Credit: Famous American singer Lawrence Tibbett with Jack O’Hagan (left) at 3AW, 1930s. Jack O'Hagan Collection, State Library of Victoria.